Inder Loves Folk Art: Practical sewing. Hello friends! It's already halfway through February!? Crazy! After weeks and weeks of rain, we have been enjoying a spell of really beautiful weather, and I have been outside, enjoying it as much as I can! Seriously, Joe is wearing shorts again and for once, it's appropriate. It's so nice here! The weather experts tell us that El Niño is not gone - the little guy is just taking a break. So I'm trying to get the most out of it! But I have done some sewing in the past couple weeks, of course. 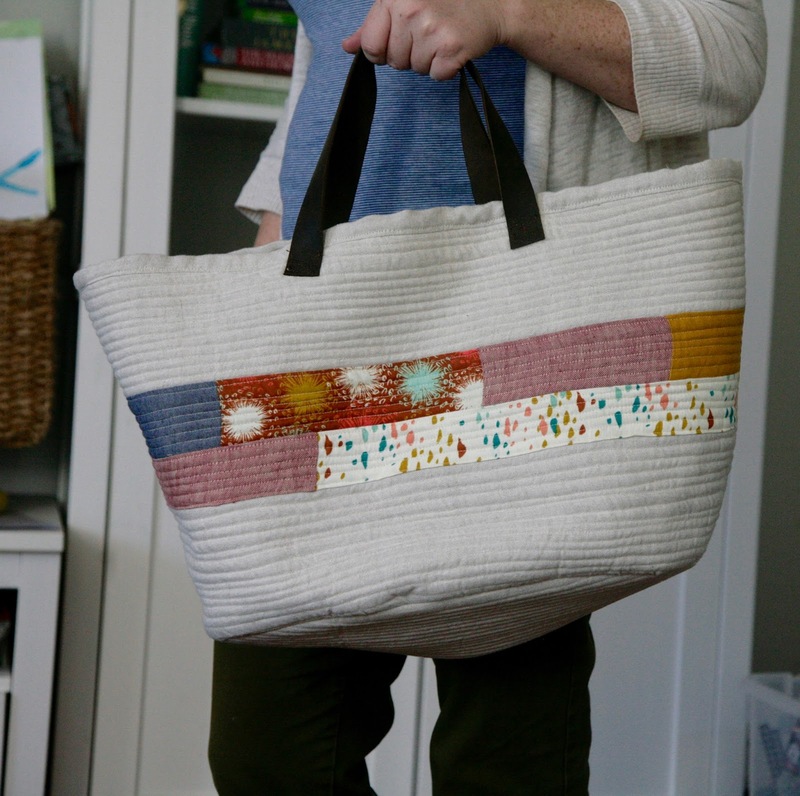 My biggest project was this Market Bag from (Noodlehead) Anna Graham's Handmade Style book, which is totally awesome and drool worthy, by the way. So many projects I want to do! At this point in my sewing career, I don't buy as many books as I used to - I am more inclined to buy patterns, which have better instructions, less errors, and more complex designs. But this book really has such a variety of projects and so far, the instructions and patterns are great. So I'm a fan! Since I'm now taking public transit to work most days, I find myself schlepping huge amounts of stuff on buses and BART, and I've been mostly using canvas reusable shopping bags. Don't get me wrong, my Farmer Joe's canvas bag is pretty great, and I'm representing Oakland for sure. But I felt a need to step up my game a bit! 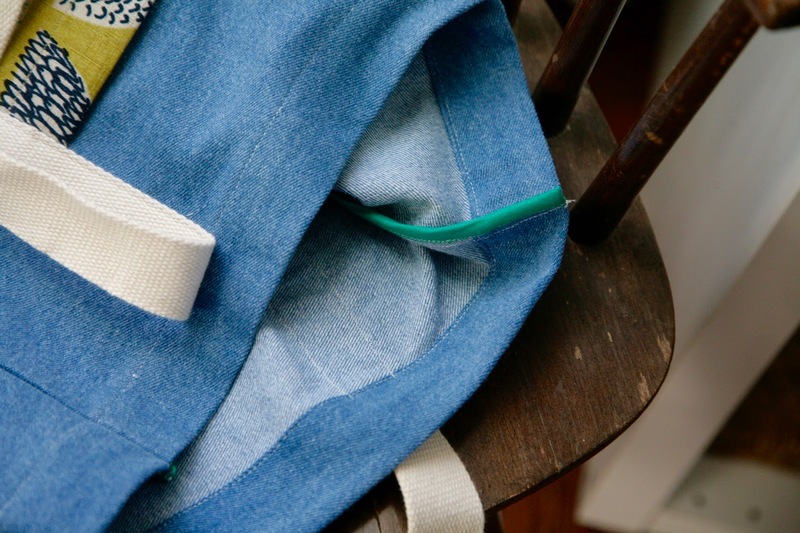 Reusable shopping bags are the bomb, but they're not exactly professional or polished. So I decided to make myself a nice tote bag. 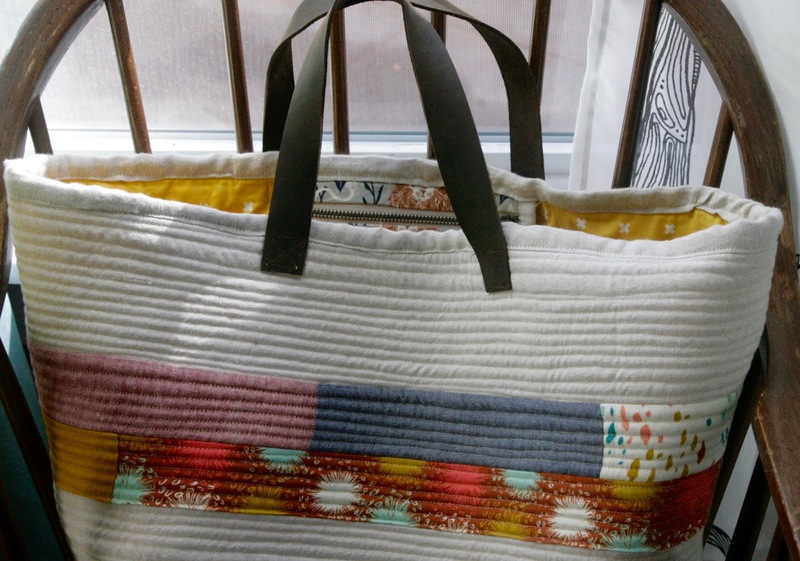 I really loved the Market Bag pictured in the book - the quilted natural linen makes the bag look more like a rattan basket, and the chambray and soft earth tones in the patchwork are so pretty! So I pretty much copied the original, and chose a natural colored linen that has been in my stash FOR-EVER (I made some pants for Joe out of this stuff in 2012 and the fabric had been in my stash for ages even then!) for the main body of the bag. Felt pretty good to use some more of this stuff up, but unfortunately I still have quite a bit. #fabricyoucannevergetridof I used stash linen, chambray, and Cotton + Steel quilting cottons for the lining, patchwork, and inside pocket. This project was definitely a little bit outside my usual comfort zone! 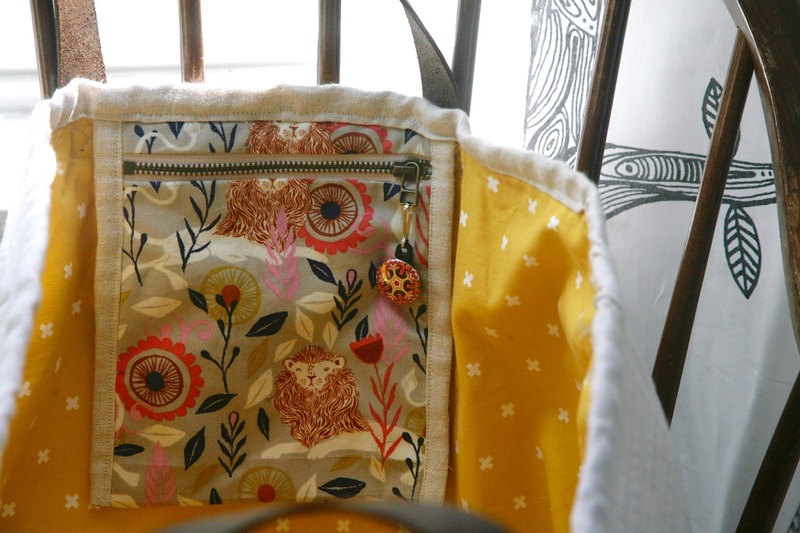 As I've moaned many times on this blog, I don't generally love sewing bags. Mostly because so. much. interfacing. Also, trying to sew curved bottom pieces onto the side pieces, with way too much interfacing, ugh. But as the years go by, I am getting better at bags, or at any rate I'm a little less intimidated by them. Still, this bag marks my first experience with this bizarre stuff, By Annie's Soft and Stable Stabilizer. This stuff is really hard to describe, but when my friend said "oh, you can substitute out auto headliner that you buy at JoAnns," I had to laugh in recognition! That's right! It seems like something that would go into a car - totally! It's like a thick synthetic foam that takes the place of batting in quilted bags. Totally industrial, not even a little natural, and very weird, but it works! This was also my first time sewing leather! I got the leather for the straps at Michael's, which wasn't ideal, and I didn't have any choice in terms of color, but I am happy with the dark brown handles. I topstitched them on with brown thread doubled up on top (I used the extra spool on my machine and ran both threads through the leather needle). It was tough work for my machine and it skipped some stitches, but so far they are holding. The inside pocket is extra special Cotton + Steel Lions - too bad I totally botched the pattern matching, right? So wrong. So so wrong. I was confused because of all of the origami instructions. Whatever, it holds my stuff, right? Moving on! The lining is a lovely mustard gold Cotton + Steel "basics" cotton. Here's a close-up of the quilting. Quilting each of the bag panels was a lot of work and took forever! But the texture of the bag is really special because of it, so I'm not complaining. I really love the soft earth tones! Although this is billed as a "quick sew" - probably for folks who are experienced at sewing quilted bags - I wouldn't call it that for me. It was a lot of work! But I do love the final product. I made this basic tote-bag in a couple of hours, using (very loosely) the Purl Bee tutorial for the Railroad Tote. 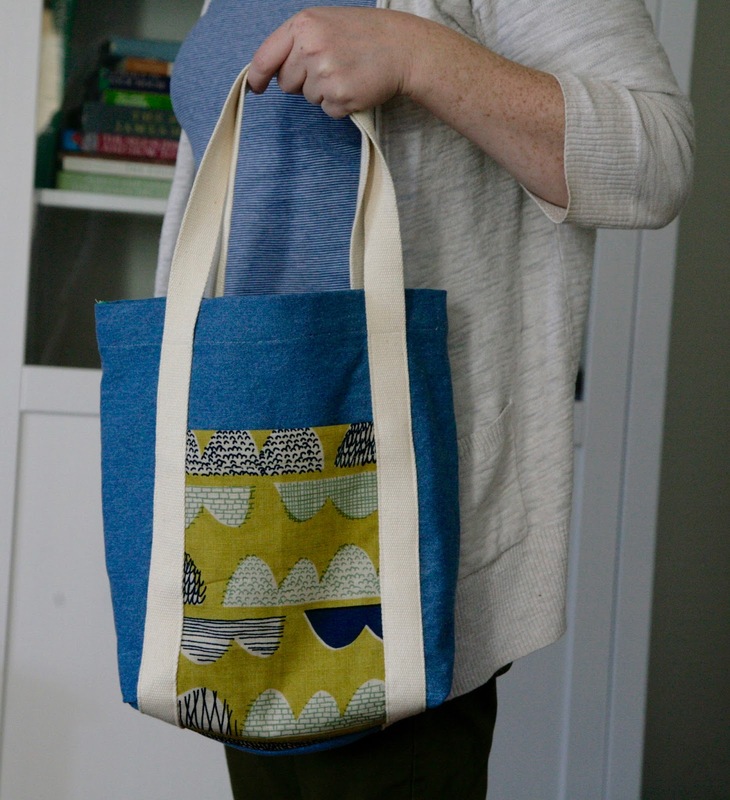 The idea was to make a smaller tote that would be big enough for a book and my lunch for days when I don't need the spacious Market Tote, and I think I pretty much nailed it! 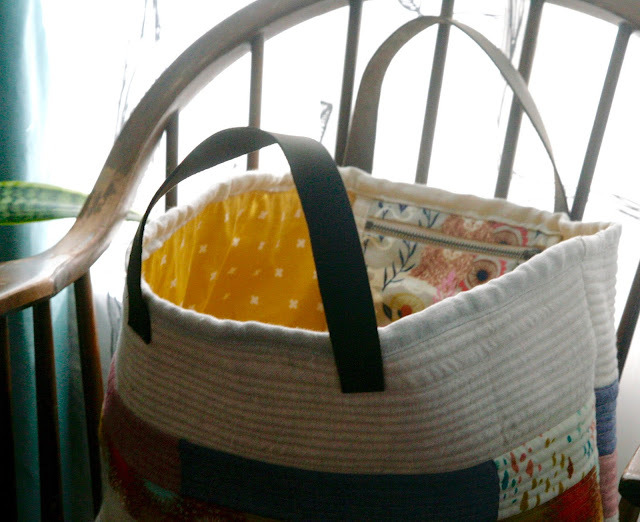 The Railroad Tote tutorial is great, and this thing whips up so quick, you'll be amazed. I will definitely be making more of these for gifts! I did make some modifications, especially to the size, which I reduced considerably to be a book/lunch sized tote, rather than a shopping bag. 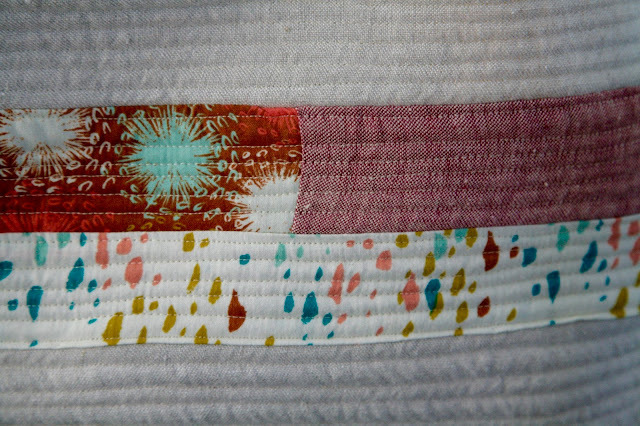 I used gorgeous Japanese barkcloth (sorry, I can't for the life of me find a link - does anyone know what this is called?) for the pocket, and a regular light blue denim for the rest. The inside seams are finished off in emerald green bias tape (that's what I had on hand). Next time I will probably put it together in a way that allows me to do the side seams before I hem the top, but this way is surprisingly fine. Here it is inside out, so you can see the bias-finished seams. Perfect? No. Completely functional? Absolutely. It's nice to have a lunch-tote that you can just throw in the wash if anything leaks. I think this will do the trick! One more project for you today, sorry for the long post! At some point sewing the Market Bag, I realized I had the wrong kind of interfacing for the lining (so. much. interfacing.) - actually, this was a long story, involving an internet supplier sending me sew-in interfacing instead of fusible. 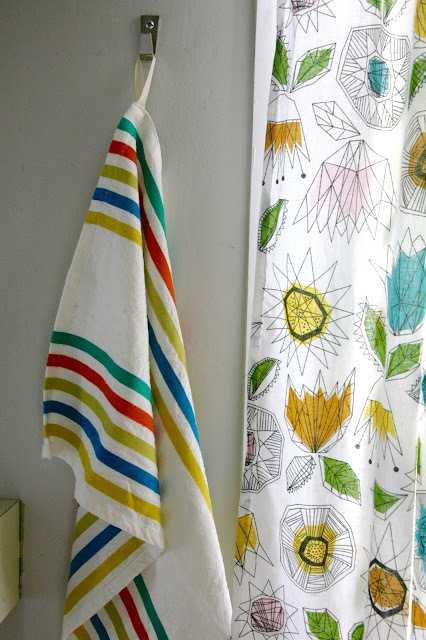 I couldn't get to the fabric store right away to get the right stuff, so while I waited, I finally checked off a project that had been on my list for ages: Make kitchen towels from toweling fabric purchased from Stonemountain. I was drawn to this fabric because of the amazing (and perfect for my kitchen) colors, but the pile of (not inexpensive!) fabric sat in my stash for months because ... let's be honest, can you think of a more boring project? So freaking boring, people. The only thing worse is curtains, kill me now. So this was quite a lot of very utilitarian sewing by my standards, but I have to say I'm really happy to have some functional and useful pieces that I can say I made myself! It's not always the most exciting sewing, but it's often the most rewarding in terms of sheer use. 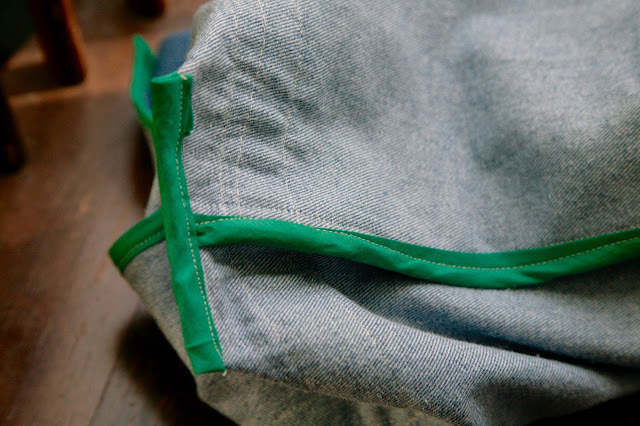 Do you sew bags? Do you sew for your home? Fun or tedious beyond belief? Discuss. Love the bags, I get in "bag moods" or "quilt moods" or "pillow moods" and those don't bother me. BUT dish towels/napkins/curtains, I'm so with you there. THE WORST. That quilting looks AMAZING. Both bags are lovely, and clearly very useful. Well done on finally sewing the dreaded dish towels - when I have 'boring' projects they just tend to sit in a pile for years (as have several of my husband's clothes that require mending). As for curtains, we still have the hideous ones that were here when we bought our house 5 years ago, but I simply can't bring myself to sew any, though I'll happily sew any amount of children's clothing. And no, I do not have ANY matching towels, nor matching tea towels, nor even matching bedding (although I did recently buy a duvet cover with matching pillow cases). Yay for homes filled with mis-matched eclectic things that don't really go together! Love all of it. 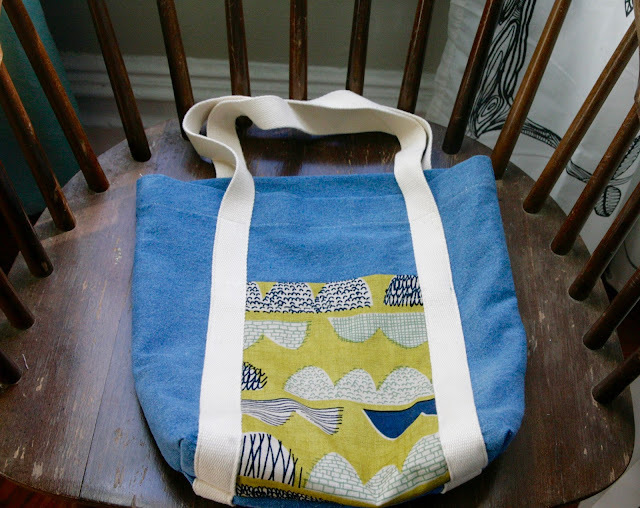 You chose such great fabrics for the bags - I feel like that kind of chic pattern mixing just eludes me. I also ADORE those towels. Adore. I can see how the sewing could have been less than thrilling, but it is so worth it for the finished product. I love the towels — I’ve often admired the toweling at Stonemountain, and it’s fun to see some sewn up. But, I totally agree with you on the boredom of towel making. I started a pile of plain muslin ones over a year ago that were to have contrasting stitching: one towel for every color of the rainbow. What a mistake. Take a boring project and add the tedium of changing thread all the time! :) Needless to say, they are not towels yet. Only the red one has been attempted. Yes, they have a great selection of toweling, don't they? 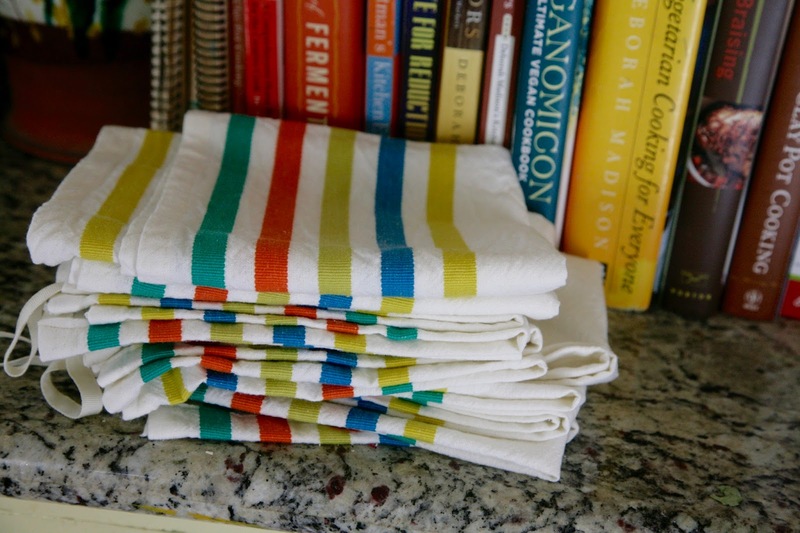 And the material really does make for great kitchen towels - they are beefy and strong and wash really well. I love your idea about the rainbow towels, but I'm laughing aloud thinking about the tedium! HA! I also went and checked out your blog - you sew some great stuff! But for some reason I'm not able to add you to my Bloglovin' feed, otherwise I'd totally follow you! I think you have to quickly sign up - if you don't want to, I understand, but if you do, shoot me a line and I'll follow you. Thanks for the compliment and for the tip about Bloglovin'. :) My blog should be followable there now. Nothing more boring than sewing curtains, but I imagine towels are a close second! Still, they look great so totally worth it. Yes, I'm very recognizable with this bag, right? Weirdly I haven't gotten many comments on it, hopefully that's a good thing, like "oh what a nice bag," rather than "whoa, what is she carrying?" Haha! The pitfalls of sewing your own things! Whatever, I enjoy it! I totally love that bag, it is gorgeous. Oh, I love all the bags! Especially that first one. I can only imagine how long it took to quilt all those panels!! I have Handmade Style sitting around and I really need to make something from it. But somehow this type of sewing gets knocked to the bottom of the pile. Kid shirts and skirts are just so much faster. This bag is so pretty, Inder! I have that book and there are quite a few projects that I hope to make, but I am pretty sure I don't have the right interfacing on hand for any of them. I made a Noodlehead Poolside tote about a year ago and decided to quilt the outer pieces. Man, was that tedious. It probably really didn't actually take THAT long but it felt like forever. The combination of fabrics you used is so beautiful. I am curious about making dish towels, now. I know it would be super boring, but mine are looking like a mess from being used for so long. That toweling is so fun and cheery! My Favorite Oliver + S Pattern!